Pembrokeshire holiday cottage, the Cwtsh at Ffynnon Clun, restored barn in traditional longhouse on west Wales coast, self catering, bed and breakfast, camping Page 3.
bench in the spring glade. stairladder, and a sofa bed in the living/dining room. organic as can be. 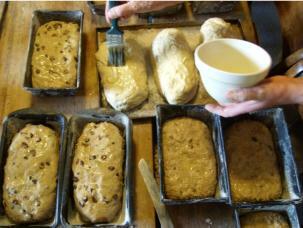 We usually bake the bread at Ffynnon Clûn. your evening meal or prepare your packed lunch for a day on the coast. supplement the wood stove. We can supply sustainably-managed firewood from our woods. Tell us when you expect to arrive so we can warm up the Cwtsh for you. regularly, to ensure it is safe and delicious to drink.